Ingredients: Sterculia, cistanche stem , hemp seed , bush cherry kernel , biota seed . Moistening the intestines to help constipation. Ingredients: Adenophora root, ophiopogon tuber , white chrysanthemum flower , lycium berry , fetid cassia seed . Tonifying liver, moistening eyes. Chinese medicine considers the eyes are dominated by the liver. The tea is helpful for people who work before computer for many hours every day. Ingredients: Magnolia flower , xanthium fruit , scutellaria root , schizonepeta , tangkuei . Opening nose orifice, clearing heat. This tea is helpful for blockaded nose, running nose, nose inflammation. Ingredients: Platycodon root , scrophularia root , scutellaria root , mint , puffball . Clearing heat. This tea is helpful for pains and discomfort of the throat. Ingredients: Salvia root , red peony root , typha pollen , carthamus flower, trichosanthes fruit . Removing fat, opening heart vessels. This tea is helpful for coronary heart disease with symptoms of needling pains, unrest, chest depression. Ingredients: White chrysanthemum flower , prunella spike , ligusticum root , scutellaria root , corydalis tuber. Clearing heat, quickening blood circulation, stopping pains. This tea is helpful for headache due to too much thinking, trauma headache, hypertension headache. Ingredients: White chrysanthemum flower , gastrodia root , crataegus fruit , gardenia fruit , abalone shell . Clearing heat, resolving fat. This tea is helpful for hypertension. Ingredients: Cooked rehmannia root , tangkuei , white peony root , flowery knotweed root , gastrodia root . Tonifying blood, stopping dizziness. This tea is helpful for dizziness caused by lack of blood. Not suitable for dizziness due to hypertension. Ingredients: Corydalis tuber, toosendan fruit , salvia root , typha pollen , red peony root . This tea is helpful or trauma and injury. Ingredients: Fangji root , lonicera stem and leaf , star jasmine stem, siegesbeckia , red peony root . Clearing heat, resolving dampness. 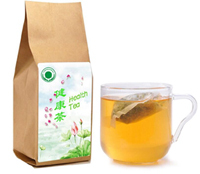 This tea is helpful for hot rheumatism with symptoms of burning pains of the joints.